Apple iPhone 8 Plus is equipped with stereo speakers that deliver a powerful sound. The Touch ID fingerprint sensor allows you for unlocking of this Apple mobile.Do what you love to do with the Apple iPhone 8 Plus. It is fueled by an A11 Bionic CPU that has the power and efficiency to run extraordinary augmented reality games and apps flawlessly. Furthermore, the three-core GPU delivers an outstanding graphics performance with less drain on the battery. Thanks to the 64GB internal memory, you do not have to think twice before downloading a high-end game from the App Store. The iOS 11, with its intuitive and intelligent apps, makes your digital life simple and fun. The 12MP camera with wide-angle and telephoto lenses delivers excellent portraits as well as landscapes. The phone is equipped with a 7MP front facing camera that is equipped with features like Retina flash, backside illumination sensor, and auto image stabilizations to give you jaw-dropping selfies. The 64GB iPhone 8 Plus boasts a 5.5inch Retina HD display that uses True Tone technology for a crystal clear viewing experience in all kinds of environments. The iPhone 8 Plus has an all-glass body that is designed to perfection. The body is precision-engineered at the microscopic level to provide excellent resistance from water, splashes, and dust. The reinforced aerospace‑grade aluminum band and laser‑welded steel provide enhanced durability to the phone. On the top of that, the space-gray finish of this Apple smartphone makes it a touch of beauty. Lastly, the glass-back design enables wireless charging with the help of an efficient charging system. The A11 Bionic GPU makes the Apple iPhone 8 Plus one of the smartest and powerful smartphones ever. With 4.3 billion transistors and six cores, this CPU unleashes cutting-edge possibilities in all the high-end features of the phone. The 4 efficiency cores of the A11 Bionic are up to 70 percent faster than the A10 fusion chip while the 2 performance cores are up to 25 percent faster. The CPU intelligently directs tasks between the efficiency and performance cores, so your daily tasks like browsing the web and texting happen quickly without draining out the battery. 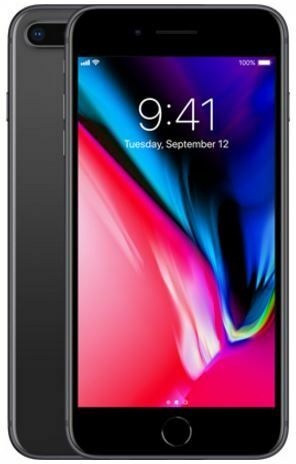 This 256GB iPhone 8 Plus is equipped with 12MP wide-angle and telephoto cameras that are packed with advanced features to give you unbelievable photos and videos. The in-built image signal processor and the power of A11 Bionic chip make advanced photography techniques automatic and easy. So everyone can click photos and shoot videos like a pro. Furthermore, the portrait mode with facial landmarking feature creates dramatic studio lighting effects. The 7MP front camera uses wide color capture, auto image stabilization, and advanced pixel technology to shoot awe-inspiring selfies. With a wide color gamut and excellent color accuracy, everything on the 5.5inch Retina HD display of this gold iPhone 8 Plus looks more vibrant and brilliant. The display has dual domain pixels that give you a crystal clear view of the screen from almost any angle. 98.4% of users recommend this product to a friend. Can I get the model number of the device? I will check if my country is under warranty. The iphone 8 plus is very good device and i am very happy i bought it. It has all the features I want. Wireless charging, waterproof, good photos and it is very fast . very fast and extremely good camera.